Sachin Tendulkar celebrates after scoring his 45th ODI century during the 5th ODI against Australia at the Rajiv Gandhi International Cricket Stadium in Hyderabad. And India's Sachin Tendulkar became the first batsman ever to score 17,000 runs in ODIs. 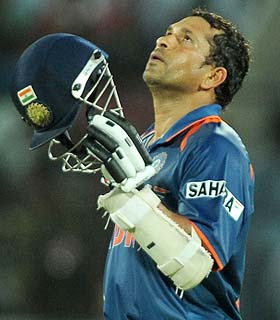 sachin contributed at his best. but why the other batsmen can not co-operate him. is not it very sameful for the team? मज सांग तुजसाठी, काय मागू देवापाशी ? anybody who have not seen Sachin's sharjah knock against aussies , then this one is for all of those fans. Awesome innings from sachin and i couldnt get off my sofa for a minute..hats off to the legend,God,Hero,Gladiator,etc....truly feel honored to be born in era of sachin tendulkar's..
Dear Sachin you are so geneous.when the 5th odi was in progress i was saw your whole ining by standing in my house.i was remembering your test ining against pakistan.they got you out near the edge of victry.i was praying not to reapet again.but in vain.ok it happens.today your carrier complitted 20 year.best of luck for your remaining lot of cricket. Your fan sudhir from kankavli.